Removalist Rosana makes the task of moving furniture easier or stress-free. There are many things to do while moving such as packing items, transporting the items and setting things at the right place. It requires a lot of efforts and skills. It is hard to manage these tasks with hiring professionals. Singh movers & packers are one of the leading furniture Removalists Rosanna who offers you the quality service. We provide you stress-free and timely House removalists Service. We are invested in special equipment which is helpful in moving heavy furniture without any damage. We have a professional and experienced team who handles all tasks with patience and make your move stress-free. We are focused on understanding your needs and give the best service according to your requirements. We are dealing with all the activities effectively. The goal of Singh packers & movers is not to harm the products when they are moving. Your products are in special supervision by our specialists. Furniture and fragile items need care and we ensure that your furniture is safe from dents, scratches and arrive in the good condition. Our materials are fully insured to protect your furniture and fittings from removal experience. From our furniture Removalists Rosanna, you will get fast, cheap and effective moving service. We are working for many years and have great experience in moving the furniture. Each customer has different needs and every moving is different. That is why we have different packages which can opt according to your requirements, budget, and timelines. We provide customized solutions and always fulfill the customer’s requirements. We have been serving all over the Melbourne residents with all that they need. They call us a one-stop solution for all of this Moving services Melbourne. We have been delivering quality services to our clients with quality skills. Our backend has a professional team who dedicatedly work to offer you all with all that you desire without even bothering you once. We will thoroughly analyze all of your needs, your stuff that needs to be shifted and all that you require from us. Our Friendly moving men will make the move easy for you in quick steps. Our team is experienced with around more than 10 years of knowledge and in-depth skills. So, Singh Movers & Packers is the moving company Rosanna who keep in mind all the concerns and requirements of customers. Singh movers will charge you for the door to door shifting only as we have kept our furniture removal quote easily so that everyone can understand it thoroughly. There is no sort of hidden charges. Singh Movers is not a company who just provides shifting but not with proper safety measures. Singh Movers treat every customer as their family and get their work done with proper safety and using professional tools. Our professional tools include dollies, heavy duty blankets, trolley, the toolkit for assembling, and disassembling furniture, ropes, shrink wraps etc. Our customer care executive team is set at the backend to help the customers with every doubts and query that they have. We will solve each and every problem. You can call or mail us at any time you want to as we are available round the clock for our client's assistance. For the removal, you need to pack all the furniture. So we also provide the packing material in order to save your items. Our professional removalists provide packing service to your materials and special attention and care. We ensure to provide a high level of protection. We offer packaging boxes, packing tape and packing paper all you required for packing your furniture. When your furniture is packed, the next step is to deliver it. Our professional removalist will unload your furniture, arrange your furniture inside your home, assemble all items and unwrap all the excessive packaging. We ensure to deliver your furniture on time and safely. We give estimated delivery time to customers. Singh Movers & Packers provides the Best Furniture delivery, Rosanna. The price of furniture Removalist depends on the distance and hours of delivery. We charge fixed price quotations. Our prices are not hidden. The actual price depends on these factors. Whether you want to relocate or shift your house, you will need a professional and experienced person. 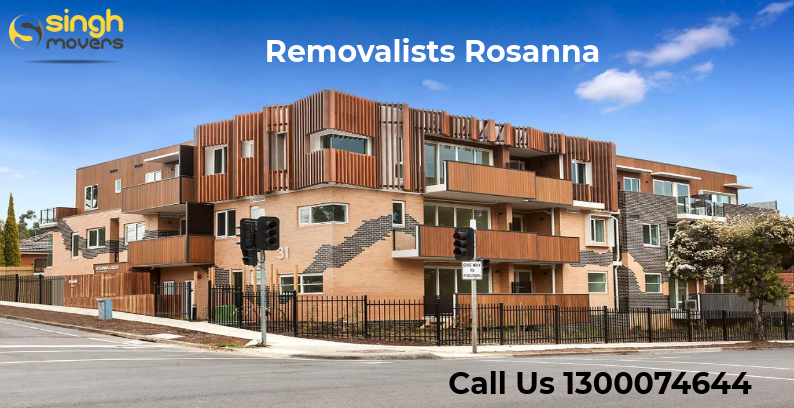 If you are searching for a reliable and efficient furniture removalist Company Rosanna then your search ends here. Singh Movers & Packers are one of the reliable and quick Furniture movers Rosanna. We will get one of the high-class services at cheap rates. We ensure that your material and furniture will arrive safely and it will get insured while transiting. Singh Movers & packers offer the most effective and efficient service to customers. We will understand everyone is attached with their furniture and fittings so take care of your items. We offer you proper safety and storage facility. Our price system is not complex; it is so simple which is understandable by everyone. Why choose Singh packers & movers for furniture Removals? Reliable and fast service:- We make sure that you can get reliable and fast service. Our professional provides you with the timely delivery of your materials and gives proper attention to your materials. Professional team:- Singh movers has a team of professional and experts who provide you with the best service. Our team is very friendly and hard-working, loyal to his job. Storage service:- When there is interstate or far travelling for the moving then Singh movers provide the storage service. We have various storage rooms in Melbourne where your furniture is stored safely for short or long duration. Affordable prices:- The prices we charge for furniture removals are transparent; that is not hidden from the customers. We charge the actual and affordable prices from customers. Happy customers:- We analyze the needs and requirements of customers then provide the service according to their requirements. We have a long list of happy customers who always prefer us for any type of removal. Secure removal:- Our professionals provide safe and secure service. We give proper attention to furniture and fragile items. Your material is also insured while moving. We proper pack your items so that they don’t get damaged while moving. Packing material:- Singh Movers & packers provides the packing material which is of high and good quality. We provide all type of packing material such as packing boxes small or large, packing tapes and packing papers. Transportation:- We are invested in special equipment so that we are able to provide you with quality service. We have own cargos and truck for transportation which minimizes the cost of removals. All these are the key features of us which make Singh Movers & packers the best furniture removalist Rosanna. We will not only focus on quality service but also on the satisfaction of customers. Customer satisfaction is our high priority. We have a record of timely delivery of furniture. Rosanna is the suburb of Melbourne, Victoria, and Australia. It is around 12 Km north-east from Melbourne’s Central Business District. According to the 2016 census, the population of Rosanna is 8498. The local government area of Rosanna is the City of Banyule. If you are planning to relocate and shift your house then Singh Movers & Packers will lessen your burden of House mover. We will provide you various types of removals. We will make your moving as stress-free as possible. We will pack, unload and arrange your material with proper safety. With our House removal service Rosanna, you will feel free and satisfied. We also charge the actual and fair price. So, give us a chance to serve or help you in the moving process. We will make your move stress-free. Call us or mail us for more details.